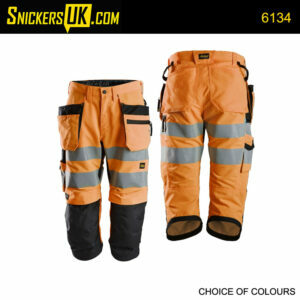 The full Snickers Workwear Range of Pirate Trousers. Maximum ventilation, superior protection. These super-light quick-drying pirate trousers combine advanced high-functionality design with 37.5™ technology and superior knee protection, ensuring outstanding cool working comfort and protection at work. Keep the pace in the heat. Light pirate trousers in high-tech body-mapped design for extreme working comfort and flexibility. Combining ventilating stretch fabric with Cordura® reinforcements for outstanding freedom of movement and durability. When you need high-visibility on a hot day, these advanced pirates are a great choice. They offer cool, dry comfort with full functionality and protection with great pockets and KneeGuard Pro.